It is a country renowned for its stunningly beautiful scenery and love of the outdoors. Even the cities have been carefully designed to preserve metropolitan green belts and parklands, ensuring that Canadians are never far from their natural heritage. 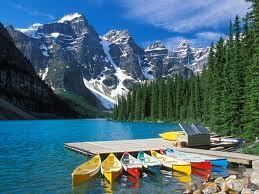 Canada is the second largest country in the world with ten Provinces and three Territories. Visitors to Canada will be spoilt for choice with its truly breath-taking scenery, its rich culture and heritage as well as its vibrant and cosmopolitan cities. There really is something to suit everyone in this amazing country. Direct flights to Canada from the UK are operated by Air Canada, BA and flythomascook. For low cost flights to Canada, try one of the many indirect flights which involve a short transit en route with airlines such as United, American Airlines or KLM. Attracting millions of visitors each year from around the world, Canada is the place to go for lovers of the great outdoors. Western Canada is renowned for its stunning scenery, with the Province of British Columbia being the country’s most mountainous and scenic of all. Home to Whistler, a world-renowned ski resort and co-host of the 2010 Winter Olympic Games it’s not difficult to see why this is a popular place for skiing and snowboarding. Water sports are readily available too. The north of the country is the place to go if you want to spot some of the country’s wildlife, including polar bears, moose, grizzly bears and whales. Explore some of the country’s vast and vibrant cities where you will be spoilt for choice with the many museums, art galleries and superb restaurants. Take your pick from the amazing Toronto, Canada’s biggest city or why not visit the country’s capital, Ottawa to explore its fantastic buildings and galleries. You won’t be able to miss Vancouver either; one of Canada’s most attractive and cosmopolitan of cities. No trip to Canada would be complete without a visit to Niagara Falls. Exploring this natural wonder will stay with you forever. For fantastic offers on cheap flights to Canada then take a look at our flight search facility with Directflights.com. 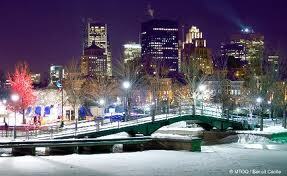 We can also help you find a great deal on lastminute flights to Canada. For the cheapest flights to Canada it’s best to book as far in advance as possible and try to avoid busy times of year for holidays. Being such a large country, Canada's climate varies depending on which area one visits. It also has very distinct seasons. The warmest months are July and August, and in winter (December, January and February) it is very cold with heavy snowfalls in most provinces. Autumn is a beautiful season with crisp air and brilliant fall foliage, while in some areas spring brings the emergence of carpets of wild flowers.